Are your Chidren's toys safe? Untidy homes are dangerous ones. Children should be taught to tidy up their toys and put them away to avoid accidents. A playpen or baby's cot should not be left overfull with toys to cause injuries by falls. Nor should a cot have access to anything with a cord or string which could strangle. The string should be no longer than 8 inches (20 cms). Do not allow your younger children to play with coins, small items, safety pins, tacks or any sharp object. Even a pencil can stab or damage an eye. Do not let your child fly a kite near electricity pylons. 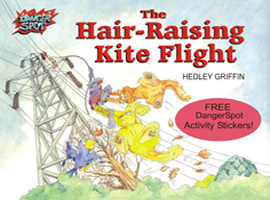 See “The Hair-Raising Kite Flight”. Do not give young children very small parts of toys or objects that are smaller than 5 cms in diameter or 7 cms long. Take the time to check for dangers in the areas where your children are playing. Try to teach your childen to put away their toys to avoid accidents and falls, and also teach them not to leaver them on the stairs. Garden swings and climbing frames should be sturdy and checked over to ensure no parts have worked loose. The ground underneath should be made soft with sand, bark chips or grass, and never concrete or stone.